Hagan Stone, REALTOR®, ABR, CRS, affiliate broker of Parks in Brentwood, is 2019 President-Elect for Tennessee REALTORS®. A veteran of 19 years in real estate, Hagan has previously served as Secretary-Treasurer (2018) and Division 2 Vice President (2015-16)for Tennessee REALTORS®, and President of Greater Nashville REALTORS® (2014). He is a recipient of the Nashville Emerging Leader Award for RE Services (2014) and a graduate of NAR Leadership Academy (2010). 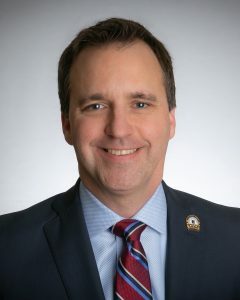 Locally, Hagan also has chaired multiple committees including Professional Development, RPAC/Legislative, and Nominating, and he was named REALTOR® of the Year in 2010. On the state level, Hagan’s leadership positions have included RPAC Trustees Vice Chair (2014). Nationally, he has chaired NAR’s RPAC Fundraising Trustees (2017) and its Leadership Academy (2015), among other roles. Born in Nashville, reared in Clarksville—which he considers home—and a 24-year Nashville resident, Hagan is a proud Tennessean who also loves to travel and experience different cultures and customs. He is a 1996 graduate of Belmont University with a bachelor’s in Communications Studies and a minor in History. He and his wife, Laura (a nurse practitioner at St. Thomas West), are the parents of Catherine, 14, and Dawson, 13. As 2019 President-Elect, Hagan is available to update Local Associations and other audiences on timely real estate topics from a statewide perspective, provide information about member services and benefits and listen to any insights or ideas that could be shared at the state level.